First let me say that this is a wonderful resource - congrats to all of you for providing such a useful, informative forum for dog owners. A few weeks ago I adopted a dog from the Glen Rose City Shelter. I had been working with a trainer to find a breed that would be a good fit for my family - I have a 5-yr old boy and a 3-yr old girl. We decided upon an Australian Shepherd but I was very adamant that we not pay a breeder for a dog. I don't plan on showing or breeding myself and there sre so many homeless pups out there. I wanted to rescue a young dog in the 1-yr to 2-yr age range. Then a few weeks ago the trainer emailed me a photo of four littermates at a shelter in Glen Rose, TX, a few hours drive from here. The shelter told us that the breeder had sold some of the litter's pups and couldn't keep the rest. I spied Blue in the photo and instantly knew he was our dog. There was something about the way he was in the back but looking directly, calmly at the camera that spoke to me. The ladies at the city shelter were good enough to hold him for me until I could drive down to pick him up. He's such a great dog. He is about four months old now and we have had him almost a month. He is smart and eager to please. Blue is definitely a puppy though so we're working on the nipping and chewing. Clever dog that he is though he doesn't chew things that aren't his unless he thinks we're not giving him enough attention. I try to keep him exercised and occupied. I've learned that a tired puppy is a good puppy. Also, I've learned that when I need computer time I can put a treat on the floor and tell him to leave it. He'll either stay and stare at the treat or go find one of his toys instead of grabbing my socks and running in to the other room. Good boy. I'm looking forward to training him. He is very smart and very intuitive. What a wonderful addition to our family! How CUTE is that puppy. Congratulations on getting him. Sorry you had a tough experience getting him but I'm sure after all that conversing you understand why. The good part is that you have that understanding and you sould very savvy on how to make sure kids and dog are happy and best friends. Some times shelters are just so overwhelmed they aren't necessarily able to be the most tactful or educational possible. AWWWWW! And a big AWWW. How adorable...he's definitely a cutie!!! Around here, most fosters aren't people with young children, so many of those shelters are likely to have dogs that they aren't so sure about with kiddos. This could explain their reluctance to accept your applications. Nonetheless, congrats on your gorgeous pup. Sounds like you guys are on the right track. Check BellaPup's blogs for puppy troubleshooting. 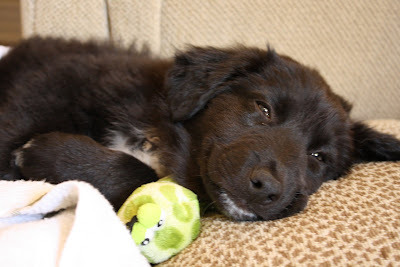 She was a first-time puppy owner and blogged the issues she ran into. Those should be helpful. If you have any questions, post it here in the lounge. We're usually pretty quick to reply. He looks like such a snuggler. :dogblush: Aussies are wonderful to work with. I really love the breed. Good luck and enjoy the site! Thanks for the welcome and advice. The Aussie rescue groups I contacted were all very nice and the fact that they wouldn't adopt a dog to me was because of their concern for the dogs. I totally understand - being a herding breed they nip and it can get out of control easily. Also, there are parents out there who don't have a lot of respect for the family dog. I've seen parents let their toddlers pull ears, grab fistfuls of fur and worse. When the dog finally protests the parents get mad at the dog. Go figure. Most of the rescue groups do not have foster homes with children so they can't adopt out to families with children. A few fosters had older children but the dogs they have are known to not be good with kids. The woman at the Garland City Shelter had a heartbreaking story about a young Aussie she adopted out to a family who brought her back the very next day because the dog had been playing too rough, nipped and broke the skin on their child's hand. The shelter had to put the dog down that day since policy dictates that they must euthanize animals that have bitten people. I was crying with her by the end of the conversation. It has been a long search but Blue is such a great dog I can't imagine having any other but him. I am also resolved once Blue is older to foster dogs. To all you fosters out there: you are truly angels. Fostering is a great thing. My 3yo really enoyed our 1.5 year old foster so much that I'll def repeat again when this 1yo is old enough that it won't kill me. :dogrolleyes: It was so cool doing a sort of adult dog too b/c a lot of the training wasn't just chasing her around. She was scared so it was slow going but the rewards were so HUGE for all of us. Every day I saw a little light come back to her. Oftentimes it's a bit difficult to find a good family candidate with a herding breed rescue--as most herding breeds who are given up to rescues were with families who didn't know what they were getting into, therefore they haven't really been "family dogs" and aren't ready for family life. Border Collies are given up in mass amounts, many from families with kids--the kiddos come along and that once-a-day walk isn't so important anymore. Bye bye leather couch...and bye bye Border Collie. Someday down the road I really want to foster. Don't have the time right now, but I would love to. I'm sure I'll probably fall apart when my foster gets adopted when I am able to, but it'll feel good too. My youngest cousin shares her home with a Boxer and a Bassett--the kids are very good with the dogs, and the Bassett's favorite gave is to give little Hope rides. (She's tiny and very young, and he's huuuuge for a Bassett.) She'll hop on and he'll walk around for a little while, lol. He enjoys it and she's still small enough to not cause him any harm, so it's fun for the both of them. ^^ But as you said, not all parents teach their kids how to treat the dogs. A big reason why many dogs end up in shelters.